GILMOUR, ALLAN, timber merchant, lumber manufacturer, sportsman, militia officer, and art connoisseur; b. 23 Aug. 1816 in the parish of Shotts, Scotland, only son of David Gilmour, a farmer, and Betty —; d. unmarried 25 Feb. 1895 in Ottawa. Allan Gilmour was a nephew of Allan Gilmour*, who had joined John and Arthur Pollok in 1804 to set up Pollok, Gilmour and Company. This firm later entered the timber trade in British North America through family agents who set up purchasing offices in New Brunswick and at Quebec and Montreal. The Montreal branch was established in 1828 under William Ritchie* as William Ritchie and Company, a general mercantile firm which bought square timber and deals and shipped supplies to lumber camps in the Ottawa valley. Allan Gilmour of Shotts (so named to distinguish him from his uncle and another nephew, Allan Gilmour* of Quebec) was educated at the common country school, and in 1832 he and his cousin James were sent out to the Ritchie firm as clerks or “cadets.” Their arrival brought a new spurt of entrepreneurship to the company. It became very aggressive in purchasing timber, sending agents up-country to outbid competitors. The cousins took over the firm in 1840, when Ritchie retired, renaming it Gilmour and Company, though it retained its close connection with the Gilmour and Pollok interests in Great Britain. From the mid 1840s the firm apparently acquired property and potential industrial sites to position itself better in the timber and lumber trades. An early part of this strategy was the opening of an agency in Bytown (Ottawa) under the management of John Porter, who continued to procure timber and sell supplies. More and more, the company’s attention turned to the Rivière Gatineau, following the end of a cutting monopoly there in 1843 [see George Hamilton*]. At the same time, the decline of protective duties for colonial timber in the British market was forcing producers to turn their attention to the manufacture of sawn lumber for the American market. One of the few square-timber firms to make the transition, Gilmour and Company repositioned itself for this trade. In 1852 the company built mills at Trenton, on the Bay of Quinte in Upper Canada, to tap the forests of the Kawartha Lakes, the Moira valley, and the upper Madawaska valley. It acquired the mills and timber rights of Nathaniel Sherrald Blasdell and Julius Caesar Blasdell at Chelsea on the Gatineau in 1853. That year Gilmour moved to Bytown, making it the company’s headquarters and reducing Montreal to an agency. 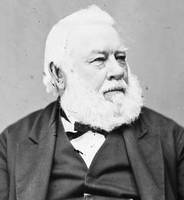 In so doing, he established what would become one of the largest timber operations in Canada, centred in Ottawa, Hull, and the Gatineau. At first, Gilmour had good reason for worry. Business did not go well and in February 1857 James Gilmour died. That year, however, Allan engaged a Scottish woods- and mill-manager, John Mather*, whose skilled guidance for 20 years built the company into a major enterprise. The Blasdell mills were rebuilt with new saws and other technological improvements, including equipment for feeding logs to the saws and removing boards and scraps. The company also acquired mills on the Rivière Blanche and the North Nation (Rivière de la Petite Nation). Aided by the Reciprocity Treaty of 1854 with the United States, production had increased by 1860 and the firm was prospering. The Gatineau mills were served by expanded piling grounds and wharfs at Ironside, near the mouth of the river, and the Trenton operation was expanded as large steam-mills. If a worrier in business, Gilmour knew how to relax. He loved to travel and enjoyed shooting, fishing, and steam-yachting on his own vessel, the Cruiser. He was a member for many years of the Long Point Shooting Company, had salmon-fishing rights on the Rivière Godbout (near Pointe des Monts on the north shore of the St Lawrence), and was an active curler, serving as president of the Ottawa Curling Club. Gilmour was a major in the militia during the Fenian crisis of 1866, and carried the sobriquet Colonel. 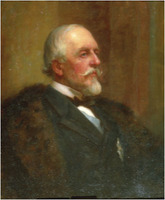 Finally, at his mansion on Vittoria Avenue, overlooking the Ottawa, the lumber baron assembled one of the fine early art collections in the country, which included works by Cornelius Krieghoff*. 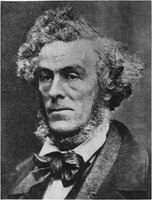 In 1873 Gilmour decided to retire from business to enjoy the fruits of his labour, carrying out those activities of hunting, fishing, travelling, reading, and collecting art which he enjoyed best. Since he was a bachelor, the firm passed to other members of the family who had been involved in the timber trade at Quebec: John, Allan, and David Gilmour, the sons of John Gilmour*, and a cousin, J. D. Gilmour. The next year Allan Gilmour travelled to Europe and later to Egypt, where he descended the first cataract of the Nile by boat, and to the Holy Land and other parts of the Middle East. Returning to Ottawa, he lived a quiet and cultured life. He became a “warm and valued personal friend” of Governor General Lord Dufferin [Blackwood*] and Lady Dufferin, with whom he went on fishing trips. Gilmour read works which, though they did not lead him to abandon his Presbyterian religion, did give him a broad faith and recognition of all denominations and creeds. 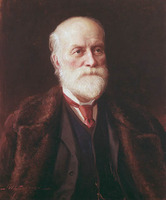 He continued to patronize the arts and in 1879, with Edmund Allen Meredith, Sandford Fleming*, and others, he founded the Art Association of Ottawa to promote the creation of a “National Gallery” and an art school. 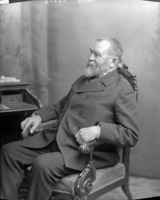 During the 1880s Gilmour served as president and vice-president of the association. 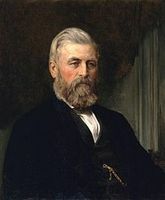 He died quietly at home on 25 Feb. 1895, never unhappy that he had turned his back on business at a relatively early age. Allan Gilmour left an estate worth $1,452,825, which included his 146-piece art collection, valued by local artist Peleg Franklin Brownell at $11,163. Under the terms of his will, sums totalling $265,000 were bequeathed to sisters in Scotland, two former employees (his bookkeeper, James Cunningham, and John Mather), and local charities. The bulk of his estate, including his investments, house, and collection, was gifted to a close friend and his living companion during his last months, John Manuel, who had been a senior officer in Gilmour’s company and was possibly a stepson of his sister Marion. AO, RG 22, ser.354, no.2625. Baker Library, R. G. Dun & Co. credit ledger, Canada, 13: 206. GRO (Edinburgh), Shotts, reg. of births and baptisms, 15 Sept. 1816. NA, MG 24, I89 (mfm. ); MG 26, B, Gilmour to Mackenzie, 21 Dec. 1878; MG 28, III6, 133, 148; RG1, L3, 216A: G4/121; 217: G5/21; 218: G6/77; 220: G8/51, 87; 301: L7/11. [H. G. Hamilton Blackwood, Marchioness of] Dufferin [and Ava], My Canadian journal, 1872–1878, ed. Gladys Chantler Walker (Don Mills [Toronto], 1969). Canadian album (Cochrane and Hopkins), 4: 386. Canadian men and women of the time (Morgan; 1912), 447, 728–29. Cyclopædia of Canadian biog. (Rose and Charlesworth), vol.1. Dominion annual reg., 1880–81: 169, 174, 325; 1883: 240; 1884: 208. G. E. Boyce, Historic Hastings (Belleville, Ont., 1967). Gwyn, Private capital. J. W. Hughson and C. C. J. Bond, Hurling down the pine; the story of the Wright, Gilmour and Hughson families, timber and lumber manufacturers in the Hull and Ottawa region and on the Gatineau River, 1800–1920 (Old Chelsea, Que., 1964). William Leggo, The history of the administration of the . . . Earl of Dufferin, . 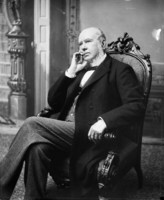 . . late governor general of Canada (Montreal and Toronto, 1878). A. R. M. Lower, Great Britain’s woodyard: British America and the timber trade, 1763–1867 (Montreal and London, 1973). John Rankin, A history of our firm, being some account of the firm of Pollok, Gilmour and Co. and its offshoots and connections, 1804–1920 (2nd ed., Liverpool, Eng., 1921). 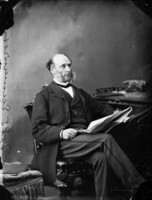 Robert Peter Gillis, “GILMOUR, ALLAN (1816-95),” in Dictionary of Canadian Biography, vol. 12, University of Toronto/Université Laval, 2003–, accessed April 21, 2019, http://www.biographi.ca/en/bio/gilmour_allan_1816_95_12E.html.